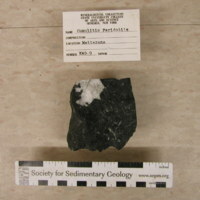 Sodic pyroxene, glaucophane, lawsonite, chlorite. 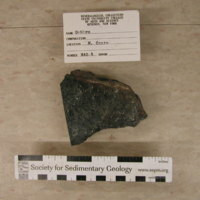 Pseudomorphs of sodic pyroxene and glaucophane,chlorite on original augitic pyroxenes; pseudomorphs of lawsonite and glaucophane on original plagioclase. 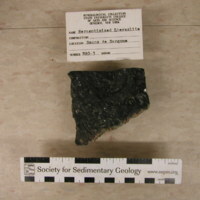 Antigorite, magnetite, ankeritic carbonate, diopside, tremolite. A very marked subsequent foliation nearly completely obliterates a previous initial foliation. 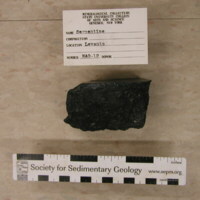 Antigorite, magnetite, carbonates (ankerite), diopside, clinohumite, tremolite, chlorite. 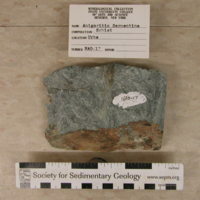 Rarely, pseudomorphs on primary pyroxenes may be recognized, though there is superimposition of various deformational phases. 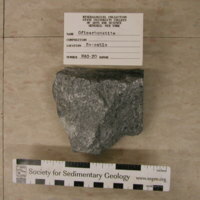 Gabbro with hydrothermal "oceanic" processes and prehnite-pumpellyite metamorphic overprint. 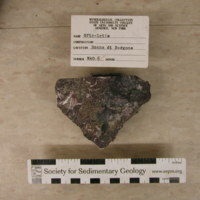 Doleritic basalt with metamorphic overimprinting in prehnite-pumpellyite facies. 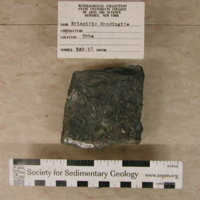 Primary minerals: plagioclase, titanaugite, ilmenite, olivine. Metamorphic paragenesis: albite, pumpellyite, prehnite, sphene, chlorite. 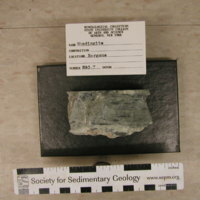 Serpentine (lizardite) with some structural deformation present. 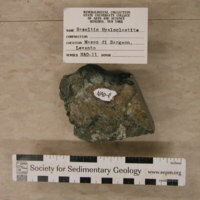 Hyaloclastite of basalt with superimposed metamorphism in pumpellyite-prehnite facies. 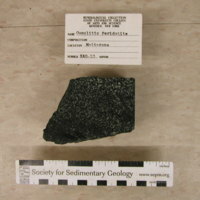 Serpentinized peridotite with plagioclase, olivine, plagioclase, clino-pyroxene, chromite. 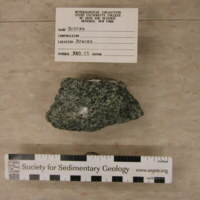 Secondary minerals include hydrogrossuaria as well as serpentine, chlorite, prehnite. 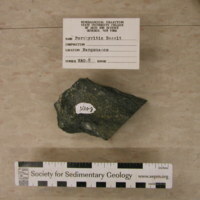 Peridotite, serpentinized, with plagioclase with harrisitic structure. 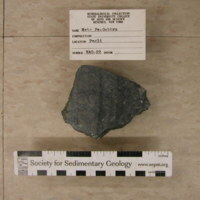 Basalt dike in gabbro with prehnite-pumpellyite overprint. 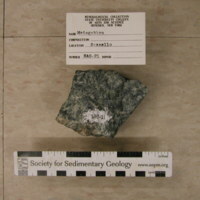 Rhodingitized gabbro dike in serpentinite. Chlorite, hydrogrossularia, diopside, prehnite, pumpellyite, vesuviane. 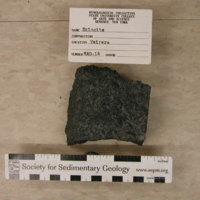 Tectonic-sedimentary breccia of serpentinite modified by hydrothermal events in oceanic environment. 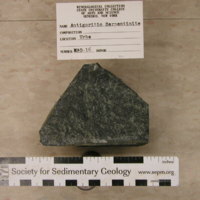 Dioritic gabbro with deformational oceanic metamorphism of amphibolitic to greenschist facies and overprinting of prehnite-pumpellite. 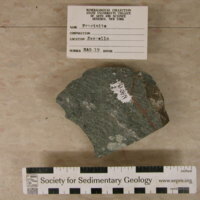 Traces of oceanic metamorphism in greenschist-amphibolitic facies and weak overprint in prehnite-pumpellyite facies. 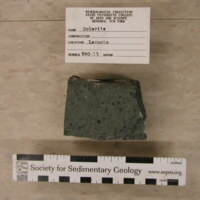 Partially serpentinized tectonic lherzolite. 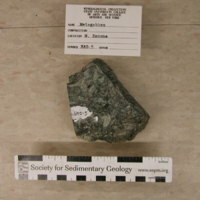 Occasionally newly formed diopside may be noted.